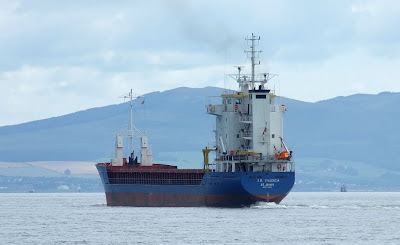 Heading up the Clyde this morning to uplift a cargo of scrap metal from Shieldhall, Bockstiegel's coaster A.B. VALENCIA dates from 1996. She was launched in Romania as SAAR VALENCIA, but like other members of the class was renamed while being completed in Holland. A.B. VALENCIA is 89.75 metres long, and has a deadweight of 4,211 tonnes. Her last port was Liverpool.